CuSith is one of two death hounds living in Volkihar Keep, along with Garmr. Each can be used as a follower if you join the Volkihar vampires. They function exactly like the other animal followers, having only 'wait' and 'follow' as commands, following the typical behavior of running and attacking things on sight, and are allowed to be recruited in addition to an NPC follower. When first talked to, the only option available is "Ready for some bloodshed, beast?" Selecting this, you are given the options of "Let's sate our hunger together." (which gains him as a follower) or "Silence, cur. No meat for you today." (which dismisses him). If gained as a follower, you have the option to tell him "Wait here." (which does just that) or "Time for you to head home." (which dismisses him from your service). 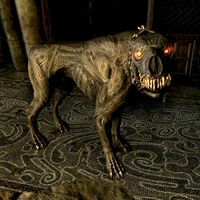 Due to a bug in the voice files associated with male death hounds, they will show subtitles saying 'whine' or 'growl' but no sound will be heard. This applies to both CuSith and Garmr. This bug is fixed by version 2.0.4 of the Unofficial Dawnguard Patch. Both of the death hound followers have the same stats and level as a normal death hound instead of the usual 10-25 level range on other dog followers. As a result they are quite weak compared to other dogs. This bug is fixed by version 1.1.4 of the Unofficial Dawnguard Patch. This page was last modified on 10 October 2014, at 00:21.